Comes with child safe breakaway chain connectors. 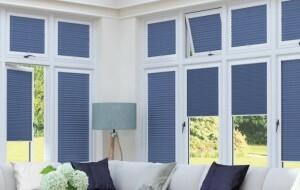 Roller Blinds continue to provide the most practical and economic style of window shading. Their flexibility means the requirements normally experienced both in the home and the office are fully met. The Collection combines the tones of contemporary weaves and textures with the exclusivity of traditional and designer prints. All will add an extra dimension to any room. We support this with a comprehensive range of decorative, blackout, solar reflective and fire retardant fabrics. Suitable for just about anywhere in the home and office. A safe by design, child safe option. Spring operated Roller blinds come complete with a decorative pull as standard or you can customise them with the pull of your choice. 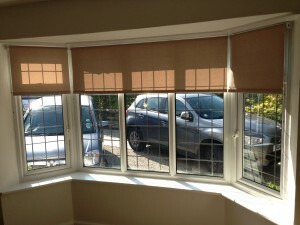 Spring operated Roller blinds eliminate the need for a chain making them inherently child safe. Upgrade to the Senses Slow Rise Roller Blind, incorporating the “Slow Rise” spring function with pre-set speed and stop variants for one touch operation. For the final touch of luxury these come complete with a fascia that can be wrapped with contrasting or co-ordinating fabric. Louvolite ® Perfect Fit ® Roller Blind System, A revolutionary invention designed for double glazed windows that eliminates the need to drill any holes into your UPVC window frames, as the brackets slide behind the compressible rubber seals of the window. The Roller Blinds run behind the Perfect Fit ® aluminium frame system (available in a choice of colours) Also the Perfect Fit ® system does not take up any of your window sill space. Great for tilt and turn windows also.